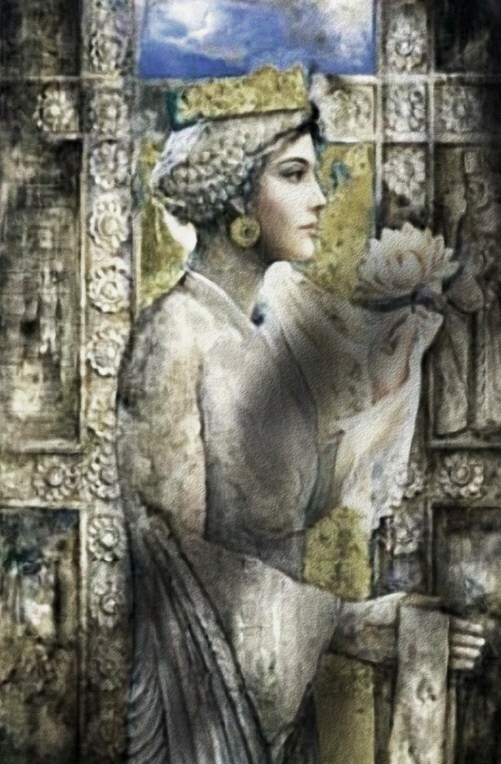 Roxane -her name Roshanak means “little star”- was the daughter of a Sogdian nobleman named Oxyartes (Vaxšuvadarva), who defended a mountain fortress against the invading army of the Macedonian king Alexander the Great. When the fortress was captured, the sixteen year old woman was among the prisoners of war. At that stage of his campaign in the Achaemenid empire, it had become obvious that Alexander could not control his conquests without doing concessions to the native population. He had to show respect to their customs if he wanted their loyalty. In the years 330-327, we see Alexander appointing Persians in important functions, dress himself like an Iranian nobleman, introduce the oriental court ritual (proskynesis). Marrying a local princess was a logical step. The obvious candidate was Barsine, who had been Alexander’s concubine since the battle of Issus in November 333. But this lady, who had already given birth to a son named Heracles, was ignored. It is not known why, but she may have been unacceptable to the Iranian population, because she had spend a great deal of her life in Europe. Barsine may have been too Greek; an extra argument for this hypothesis is that later, she settled herself in Greece. Another, more romantic, explanation may be that Alexander had simply fallen in love with Roxane. The marriage was concluded according to the local customs, and Roxane followed her husband when he invaded India 326, where she gave birth to a child that died soon. She accompagnied Alexander to Babylon 325-324, where her husband died on 11 June 323. She was pregnant. In the next years, the era of the Diadochi, Roxane had a very difficult position. 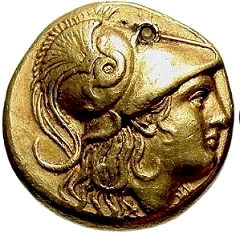 One of the commanders, Perdiccas, was chosen as regent for Alexander’s mentally deficient brother Philip Arridaeus and his posthumous son, Alexander. Together, Perdiccas and Roxane saw to the execution of Alexander’s second wife, Statira, who might have become a rival. However, Perdiccas died soon after, and the Macedonian commanders came together to discuss the future. During this meeting at Triparadisus, they decided to divide the empire. A new but weak regent, the old Antipater, was appointed. He ordered Roxane, Philip and the baby Alexander to go to Macedonia. For a woman who had grown up in Sogdia, had seen India, had lived in the palaces of Persia and Babylonia, it must have been a strange experience to live in a provincial town called Amphipolis in barbarous Europe. For several years, she and her son were safe, but one of the rival commanders, Cassander, captured them in 316. Five years later, Cassander and the other Diadochi concluded a peace treaty in which they agreed that they would remain in charge of the empire until Roxane’s son would become king in 305. This was of course an incentive to execute the boy king and his mother, who were executed immediately 311/310.